By Keith Cowing on June 30, 2015 6:54 PM. "SpaceX's explosive mission failure may benefit Orbital ATK Inc. as the two compete for future contracts to supply the International Space Station, according to Cowen & Co."
"The launch failure by itself is not much of an issue," Ostrove told me. "Most people in the industry understand that launching rockets into space is really difficult and occasional failures are just the price of conducting launches. Overall, SpaceX has a pretty strong record of success (about 95%) with the Falcon 9." "Senate Armed Services Committee Chairman John McCain (R-Ariz.) defended SpaceX on Monday after its Falcon 9 rocket exploded two minutes after a launch over the weekend. "I am confident that the that this minor setback will in no way impede the future success of SpaceX and its ability to support U.S. national security space missions," he said in a statement, noting the company has previously launched seven successful trips." "The explosion Sunday of a Space X Falcon 9 rocket shortly after liftoff directly affected NASA and a resupply mission to the International Space Station, but its aftershocks could affect the military's plans for future launches of its spy satellites." By Keith Cowing on June 29, 2015 3:52 PM. "According to SpaceX telemetry received from the Dragon spacecraft showed that it too was functioning after the mishap occurred and telemetry continued to be sent back from Dragon for a significant period of time. SpaceX now confirms that the U.S. Air Force Range Safety Officer did initiate a destruct command but that this command was sent 70 seconds after the mishap occurred, as a formal matter of process. There was nothing left to destroy at that point." By Keith Cowing on June 29, 2015 11:15 AM. "SpaceX and Dulles-based Orbital ATK won contracts to carry cargo to the station. Then last year, NASA awarded contracts to SpaceX and Boeing to develop capsules that can carry astronauts to the space station, with the first such mission scheduled for December 2017. Politics may confound that. Congress recently slashed more than $300 million from the administration's budget request for the commercial crew program. Sen. Bill Nelson (D-Fla.) said the cuts would delay the mission by two years. And that was before Sunday's SpaceX failure." Was Falcon 9 Destroyed? Answer: No. By Keith Cowing on June 28, 2015 2:13 PM.
? was destruct signal sent? Shotwell - not sure there was one. Keith's note: Dan Billow specifically asked for an answer from both SpaceX and NASA as to whether a destruct signal was sent to the Falcon 9. Gwen Shotwell answered. NASA did not. 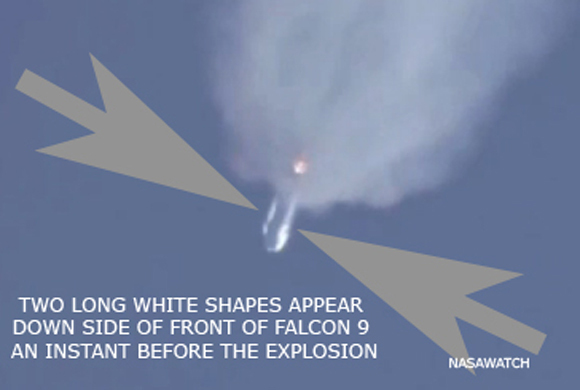 Keith's update: When I asked NASA PAO "Did the Range Safety Officer send a signal to the Falcon 9 to self-destruct?" they replied "No, the range didn't have a chance." "SpaceX now confirms that the U.S. Air Force Range Safety Officer did initiate a destruct command but that this command was sent 70 seconds after the mishap occurred, as a formal matter of process. There was nothing left to destroy at that point." By Keith Cowing on June 28, 2015 12:52 PM. Keith's note: The Falcon 9 Carrying CRS-7 either exploded or was destroyed shortly after launch a few minutes ago. SpaceX has assembled a team to look into this. NASA has referred to a launch vehicle "failure" and that the last data came down from the vehicle at T+ 2:19. No more news or NASA TV until contingency press conference no earlier than 12:00 pm 12:30 pm 12:50 pm 1:00 pm EDT. Keith's note: this is Internet rocket analysis and has nothing to do with what actually happened. Keith's note: This slow motion video from Astronomy Now shows that the Falcon 9 engines seem to be burning well after the explosion - and also that something shaped like a Dragon is seen exiting the cloud. Note: this is Internet rocket analysis and has nothing to do with what actually happened. Continue reading SpaceX Launch Failure. By Keith Cowing on June 26, 2015 7:32 PM. By Keith Cowing on June 26, 2015 1:15 PM. Keith's note: The House Armed Services Committee is holding a hearing Friday with quite a cast of characters - Tory Bruno, Rob Meyerson, Julie Van Kleeck, Frank Culbertson, Jeff Thornburg, Katrina McFarland, John Hyten, Samuel Greaves, and, to round out the fun, Mike Griffin. This hearing ought to be a classic example of the old Washington adage "where you stand depends on where you sit". "Continued reliance by U.S. launch providers on risky foreign supply chains for major subsystemsincluding propulsionhas materially weakened the U.S. industrial base. Now, however, private industry is investing internal funds to restore America's leading edge in rocket technology. As a matter of industrial policy, it makes little sense to extend reliance on foreign sources of key subsystems when American technology can step in today." "To end use of the RD-180 engine and make commercial investments in a new engine and system that will meet our national launch requirements, ULA needs the ability to compete into the next decade," said Bruno. "The House has correctly addressed concern over the RD-180 engine by allowing ULA to use engines already on contract while prohibiting additional purchases, which reflects the original intent of the FY15 National Defense Authorization Act." By Keith Cowing on June 25, 2015 4:48 PM. "NASA/JSC has a requirement for the use of an established external crowdsourcing support platform with a curated crowd in order to publically post one challenge (external to NASA) to enable interaction with an existing global solver network. Specifically, NASA requires the use of an established platform in order to run a single, short-duration challenge. NASA/JSC intends to purchase the items from InnoCentive, Inc. due to the substantial duplication of cost that is not expected to be recovered through competition. Unacceptable delays in fulfilling the agency's requirements would result given any other action due to current circumstances. ... Interested organizations may submit their capabilities and qualifications to perform the effort in writing to the identified point of contact not later than 4:30 p.m. local time on June 29, 2015. Such capabilities/qualifications will be evaluated solely for the purpose of determining whether or not to conduct this procurement on a competitive basis." Keith's note: JSC issued this non-compete notice on 24 June and wants anyone who thinks that they can do the tasks to reply before COB on 29 June - that's 5 days, 2 of which are on a weekend. Curiously, the original response date listed on the solicitation was 6 July 2015. I guess someone someone is in a hurry. JSC also issued this cluster of NASA Open Innovation Services contract awards all awarded 4 June but only announced on 23/24 June - each of which states "Contract Award Amount: 20000000" ($20,000,000) - and each of which says "Multiple Award Indefinite-Delivery, Indefinite-Quantity (IDIQ) for NASA Open Innovation Services (NOIS) were awarded NTE $ 20M overall." to Tongual, Inc., Patexia, The Common Pool LLC, Ideo LP, Ninesigma, Inc., Luminary Labs, LLC, Kaggle Inc., HeroX PBC, Appirio Inc., - and Innocentive, Inc.
By Keith Cowing on June 19, 2015 12:24 AM. "The Air Force is trying to convince Congress to give it a few more years to make the transition, arguing that it needs more time to develop, test and certify a new launch system (of which an engine is part). It wants an extension to 2022. The House-passed FY2016 NDAA provides that flexibility, but the Senate bill insists on 2019. The RD-180 and launch competition issues have become entwined. ULA has been a monopoly provider of launch services to the Air Force and intelligence community since it was created in 2006, but now a competitor, SpaceX, has emerged. DOD, the Air Force and ULA assert that they embrace the drive for competition, but want to make certain SpaceX does not itself become a monopoly provider in the 2019-2022 time frame when Atlas V's no longer can be launched (because RD-180s are prohibited), but a ULA alternative is not ready. These issues not only split the House and Senate authorizing committees, but the Senate authorizing and appropriations committees. McCain's Senate Armed Services Committee (SASC) is the one holding DOD's feet to the fire on 2019, while the other three are siding with DOD." By Keith Cowing on June 19, 2015 12:21 AM. "Satellite fleet operator SES on June 17 said it wants to reuse the first stage of the SpaceX Falcon 9 rocket that will launch the SES-9 satellite by September for a future, discounted SpaceX launch, and is awaiting the response of SpaceX. In a presentation to investors in London, SES Chief Technical Officer Martin Halliwell said he remains convinced that Hawthorne, California-based SpaceX is on the verge of proving its reusability thesis, which is that recovering, refurbishing and reusing a Falcon 9 first stage will dramatically reduce launch costs." Keith's note: Certified pre-owned rockets anyone? By Marc Boucher on June 17, 2015 10:48 AM. "Today UrtheCast released their first full-color HD video of Earth filmed in roughly 1 meter resolution of London, Boston and Barcelona." Marc's note: It's quite something to watch cars drive around from LEO. By Keith Cowing on June 15, 2015 1:47 AM. "Lockheed Martin Corp issued a warning on Sunday over the viability of its rocket launch joint venture with Boeing Co, saying the venture urgently needed the United States to waive a law banning the use of Russian engines to launch military and spy satellites. Rick Ambrose, who heads Lockheed's space business, told Reuters in an interview that concerns about the United Launch Alliance (ULA) venture's prospects had prompted the partners to approve funding for its new U.S.-powered Vulcan rocket only one quarter at time." By Keith Cowing on June 12, 2015 7:53 AM. "The amendment was defeated by a 14-16 party line vote. CJS subcommittee chairman Richard Shelby (R-AL) opposed the amendment, but said that if a new budget deal is indeed negotiated, he will work with Mikulski on how to allocate any additional funding." "Today the Senate Appropriations Committee approved the FY 2016 Commerce, Justice and Science (CJS) Appropriations Bill. The bill increases NASA's budget by $279 million above its FY 2015 budget, but underfunds NASA's Commercial Crew program by more than $300 million. Failing to fully fund the Commercial Crew program in FY 2016 would result in the United States human spaceflight gap being extended, again, and ensuring further payments to the Russians for launches of American astronauts to the ISS beyond 2017. Senator Barbara Mikulski (D-MD), Vice-Chair of the Senate Appropriations Committee, offered an amendment that would have restored the $300 million to the Commercial Crew program, avoiding a further gap and reliance on the Russians. The Committee failed to adopt the amendment." "The Coalition for Space Exploration is grateful for the strong bipartisan leadership demonstrated by Chairman Shelby and Vice-Chairwoman Mikulski in support of our nation's space exploration program in the FY 2016 Commerce-Justice-Science Appropriations bill advanced by the committee today." By Keith Cowing on June 12, 2015 7:04 AM. "But ULA isn't happy with these restrictions and has been using its influence in Congress to push back. Indeed, Rep. Mike Rogers, R-Ala., whose district houses a major ULA factory has introduced a bill rolling back the limits on Russian engines. At the same time, ULA has decided to limit production of its American-made Delta IV launcher in an effort to strong arm the U.S. military into purchasing the RD-180 until at least 2020. This underhanded tactic might benefit ULA, but it'll endanger U.S. security while enriching Russia. ULA is able to execute such a ploy because of its long monopoly on rockets for national-security launches. America's interests would be far better served if we leveraged our existing, homegrown alternatives and encouraged U.S. technology and engineering companies to re-join the global space race." Keith's note: Sen. John McCain raised the issue of continued purchase of Russian RD-180 engines on the Senate floor yesterday. Continue reading Speaking Out Against RD-180 Purchases. By Keith Cowing on June 8, 2015 8:43 PM. "Originally, SpaceX was to provide the booster rocket; Vulcan then switched to relying on rocket-maker Orbital ATK. As recently as last fall, Beames spoke about a plan to put a human-crewed spacecraft developed by Sierra Nevada on the tip of the Orbital booster rocket. But now that human spaceflight plan is shelved, along with Orbital's planned rocket. Beames said Orbital's rocket "was not hitting the economic sweet spot to generate revenue," so Vulcan has reopened the design plan and is "evaluating over 70 different launch vehicle variants." By Keith Cowing on June 5, 2015 8:21 PM. "A GoPro inside a fairing from a recent Falcon 9 flight captured some spectacular views as it fell back to Earth. Footage is played in real time. Music: Blue Danube by Johann Strauss II"
Is It Time To Kick the RD-180 Habit? By Keith Cowing on June 5, 2015 12:28 PM. "... But in recent years, Mr. Putin has become increasingly at odds with the United States. Meanwhile, United Launch Alliance, a joint venture of the defense giants Lockheed Martin and Boeing also known as ULA, has become the Pentagon's primary rocket maker and gets its engines from NPO Energomash, a Russian company that reportedly has close ties to Mr. Putin. Senator John McCain, the Senate Armed Services Committee chairman, says NPO Energomash could gain $300 million on engine sales that are to end under the law. The Pentagon, backed by ULA and American intelligence agencies, is pushing to change the law, arguing that additional Russian engines will be needed for at least a few more years." By Keith Cowing on June 4, 2015 8:06 PM. "In 2012, NASA began the design and development of a new bipedal humanoid robot, R5, through the DRC. NASA seeks to advance innovation in basic and applied research and technology development for humanoid robots, like R5, with a focus on the performance of tasks related to space exploration missions. NASA seeks to advance space technology by providing additional units of R5 to the robotics community for active research of high-level humanoid behaviors. These robots are intended to be the instruments for the SRC, which NASA will administer separately through the Centennial Challenges Program beginning in 2016." Keith's note: The R5 robot aka "Valkyrie" was developed in semi-secret by NASA JSC. Several years ago it tied for dead last in the previous DARPA challenge and can't compete this week. But JPL's Robosimian did much better last time and is competing again this year. So ... why is NASA investing all this money in R5, a last place robot design? Why not go with Robosimian instead? Or ... is NASA hoping that external teams, freed (somewhat) from internal NASA issues, might be able to rescue Valkyrie from all of its problems? If so, then maybe that's not so bad of an idea. But why does NASA need to make the R5 copies for people to use? Why not just open source the design and post it online so that others can build (and improve upon) it? After all, taxpayers paid for it. That way you get more R5 units. Why not post Robonaut's design online too? And Opportunity's? Wouldn't it be cool if the first robot that students build is one that is based upon the actual design of real robots that really work in space? As for the usual ITAR silliness NASA often cites when you ask them to release information like this - what's the big deal? R5 does not work very well (on a good day), placed last among its peers - 2 years ago, and is clearly nowhere as sophisticated as other robots. Maybe someone else can make it work better. NASA needs to take a page from the Lego Mindstorms playbook - after the public started to tinker with their in-house designs. By Keith Cowing on June 4, 2015 6:08 PM. Keith's note: Why were all of these NASA folks at the New York Stock Exchange today? This article appeared at NASA.gov today - but its just a a classic say-nothing, click bait puff piece using all the catch phrases like "Journey to Mars" at least once. These smiling NASA people are shown at the NYSE but no explanation is offered as to why they were there. Was there a meeting? Was some MOU signed? Or did NASA just spend a lot of money for these folks to travel to NYC to take a selfie and ring a bell at the NYSE to give the impression that things are happening on ISS? OK, so its a PR stunt. I get it. But does CASIS make any mention of this NYSE event on their webpage or the article NASA posted? No. Does the ISS National Laboratory mention this on their webpage? No. Also, its odd that John Yembrick from NASA PAO (who does not work on ISS commercial stuff) is on the podium yet no one from Nanoracks is present. Nanoracks is one of the real stars of ISS commerce these days. "CASIS officials told GAO in July 2014 that setting measurable targets would be arbitrary because CASIS processes and metrics are still evolving. In January 2015, however, the Chairman of the CASIS Board of Directors told GAO that setting measurable targets is a priority for the board. CASIS, however, has yet to establish a date by which measurable targets will be developed. Using the established metrics, NASA is required by the cooperative agreement to perform an annual program review of CASIS's performance." By Keith Cowing on June 2, 2015 4:37 PM. "Today the Space and Missile Systems Center released a formal solicitation seeking proposals for shared public-private investments in rocket propulsion system prototypes. This solicitation is part of a comprehensive Air Force plan to transition off the Russian supplied RD-180 propulsion system used on the Atlas V rocket by investing in industry launch solutions with the ultimate goal to competitively procure launch services in a robust domestic launch market." By Keith Cowing on June 2, 2015 10:31 AM. "The purpose of this Appendix is to provide funding for the testing or demonstration of crosscutting space technologies in relevant environments through flights on reusable suborbital launch vehicles. These flight tests should fit into an overall technology maturation plan as a bridge between laboratory testing and demonstration in Earth orbit or beyond. The proposer's organization will purchase the proposed flight(s) on currently available U.S. commercial parabolic or suborbital reusable platforms of their choice." This page is an archive of entries in the Commercialization category from June 2015. Commercialization: May 2015 is the previous archive. Commercialization: July 2015 is the next archive.